Calcium is important for building strong bones. 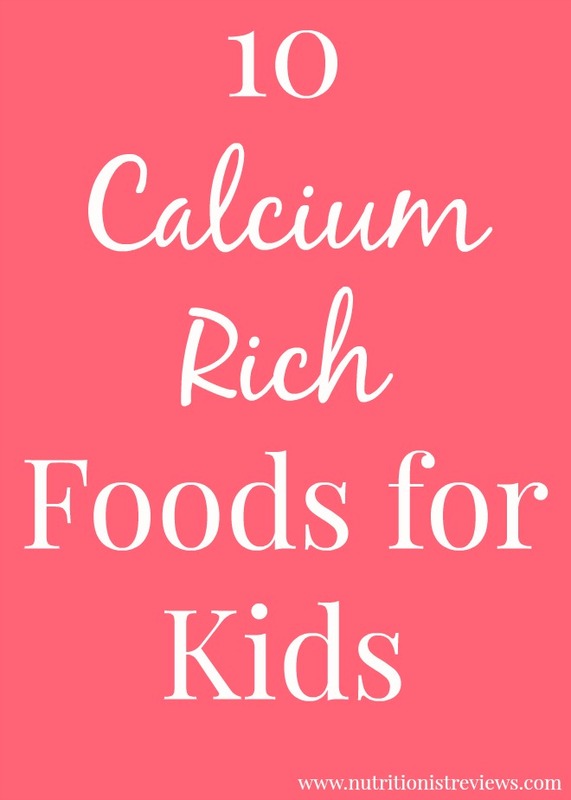 These 10 foods are rich in calcium to help your kids get the calcium they need. After stopping nursing, I started to give Adalyn regular cow's milk. The problem is that she will not drink it. She takes maybe 1 sip and then throws the sippy cup across the room. We have tried many things and she is not a fan of drinking milk plain. As a registered dietitian, it is very important to me for Adalyn to get enough calcium. I talked to her doctor about it and he said that she needs about three sources of calcium-rich foods per day. I dug back into my knowledge from school about alternative sources of calcium beyond milk. Of course, dairy rich foods are high in calcium but so are some other foods. The Institute of Medicine recommends that kids ages 1-3 get 700 milligrams of calcium per day. Kids 4-8 need 1,000 milligrams and kids 9-18 need 1,300 milligrams of calcium each day. Calcium is important for building strong bones, especially during childhood. Kids, especially girls, who do not get enough calcium are at risk for osteoporosis when they get older. Calcium is also important for helping muscles and nerves to work properly. Adalyn absolutely loves yogurt and it is one of the best sources of calcium. We love a variety of yogurts, especially the Chobani Kids and Tots Greek yogurt. I love Greek yogurt because it is a good source of protein. Chobani is one my favorites because they come in so many different flavors and varieties. Chobani Kids and Tots products are awesome because they come in tubes and pouches making them mess-free which if you are a mom of a toddler, you know how important this is. A lot of times when we go on a walk, Adalyn asks for a snack so I like to bring one of these for an after-dinner treat for her. They have 25% less sugar than other kids yogurts and double the protein. Yogurt is a first ideal food for toddlers, so Chobani Tots pouches offer protein and calcium for development along with 12 mg DHA Omega 3 and probiotics. I love making banana ice cream because it is healthy, easy and tastes amazing. My 3-Ingredient Strawberry Banana Ice Cream is perfect because it contains milk and fruit- that's it. Adalyn does not mind having the milk in this because she is not drinking it straight. While we do not give Adalyn a lot of juice, orange juice is a good source of calcium. Make sure that you are getting the calcium-fortified variety which has about 260 milligrams of calcium for a 6 ounce serving. Tofu is a surprising source of calcium with 253 milligrams of calcium per serving. My daughter likes this in a stir-fry or baked with some sauce for dipping. Check the packages of tofu in-store for the one with the highest amount of calcium as milligrams of calcium vary greatly by brand. Adalyn absolutely loves cheese and it is a great source of calcium. She has a very healthy diet so I like giving her cheese which provides her brain the fat that it needs. One and a half ounces of cheese has 307-333 milligrams of calcium which is almost half of what a toddler needs in a day. Adalyn loves eating cheese plain, on a sandwich, pizza, etc. My Broccoli Bacon Mac and Cheese is a perfect kid option! Like any kid, my daughter loves cereal. I like bringing her a container of cereal to places where I need her to be quiet such as church. I made the mistake of bringing crumbly macaroons to church once and crumbs were everywhere by the end. I learned my lesson and now bring snacks such as Cheerios instead which has 10% of your daily calcium. My daughter loves kale if it is finely chopped and sautéed until it is soft. Maybe she is not the typical kid with this one! Another way to get your child to eat kale is to puree it in a smoothie where you will not be able to taste it. Baby kale has a milder flavor and blends the best. One cup of kale has about 100 milligrams of calcium. My daughter loves bean dip so much that when I let her dip her crackers or vegetables into it, she usually ends up with two handfuls of it! Haha. White beans are rich in calcium with 132 milligrams per serving. Chickpeas have calcium too with 99 milligrams per serving. Let kids dip their vegetables in hummus for a good source of protein, fiber and calcium. I always thought of broccoli as one of those foods that kids dislike but have found the opposite to be true in many cases. Many kids that I know love broccoli. We eat ours raw with dip, steamed, etc. Adalyn loves it best with a Dijon mustard sauce. One serving of broccoli has 112 milligrams of calcium. Top broccoli with cheese for a double boost of calcium. Try my Rainbow Flatbread Pizza for calcium from the broccoli and cheese. Almonds have 75 milligrams of calcium per serving. Adalyn is a little too young to eat whole almonds so I give her almond butter instead. She loves in on a banana, on oatmeal and on toast. Disclosure: This post is sponsored by Chobani. All opinions are my own. Thank you for supporting the brands that make The Nutritionist Reviews possible!